"At last! 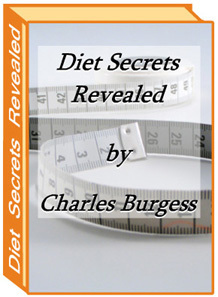 The truth about weight loss secrets - Revealed! How to lose all the weight you want and keep it off!" If you'd like to really lose all the weight you want and keep it off forever, make your weight loss dream a reality and discover a new life more exciting and more full of opportunity than you ever dreamed possible, then this might be the most important letter you'll ever read. I am going to personally show you how I lost 119.6 lbs and how I have kept those pounds off for nearly 30 years. I want to honestly share with you the 6 secrets of my success that I have never revealed to anyone before. I am doing this now because I want you and others to experience how incredible your life can become when you transform yourself from fat to fit. Reason one: I know exactly where you are today. I weighed 295.6 lbs at age 15. I suffered the same discrimination and humiliation that overweight people experence everyday. Reason two: I agree that when it comes to diets and weight loss programs it is very hard to separate the hype from reality. My six secrets are not hype. They personally worked for me over the past 30 years and continue to work for me today. Reason three: 119.6 lbs later, I am the proof of what anybody can achieve. Sure there are experts who know a lot more about the science of weight loss than I do. But most have never been there personally. I have walked in your shoes and continue to walk in those shoes today. Its true. You really can lose all the weight that you want to lose. But, it’s going to be up to you. If this is the first time that you are considering one of the many diets or weight loss programs out there, maybe you’re finding it hard to separate the hype from reality. That’s no surprise considering the advertising we see every day with headlines like “Lose 15 to 20 pounds in one week” or “Lose weight without giving up any of your favorite foods” and other nonsense. Maybe you’re one of those people who tried those diets and found out the truth the hard way. Or maybe you’ve battled to lose weight before and somehow you couldn’t get it together. You may even have lost a great deal of weight only to put lots of it back on again, for some or other reason. But, can you really lose weight and keep it off? Forever? The answer is a resounding yes! You can lose a few pounds if that’s what you want to do, or lose two or even three hundred pounds or more, and get rid of it forever. It really is possible. No matter whether you’re a guy or a gal, no matter how old or young you may be. Now I can’t guarantee this since I don’t know you personally, but I can tell you that people all over the world are shedding the pounds that they don’t need and in the process are discovering that their lives can be more exciting than they ever thought possible. I am 6ft tall and weigh 176lbs. That wasn’t always the case. I weighed 295.6lbs at age 15. My size readily drew the attention of others. Most of the attention consisted of stares and hurtful comments. I suffered the same discrimination and humiliation that overweight people still experience every day. Maybe you know what I'm talking about? Have you ever experienced what it feels like to look forward to going out somewhere special, and to get all dressed up and feel really, really great, and then just as you’re about to leave, catch sight of yourself in a mirror. And suddenly feel that confidence and excitement drain away. And now you would rather just stay at home! If you can relate to what I am talking about then this ebook is for you. It's going to help you transform your life. If you don't relate to what I am talking about, then don't waste your time and energy reading any further. Revealing the 6 secrets will not help you. I am going to tell you in a very personal way about the challenges that I faced as I battled to find an answer to my weight problem. I found out that in most cases it was the lack of knowledge about what to expect and how to deal with the unexpected that caused me to lose my motivation to succeed. I was also not aware of some of the techniques and principles that can positively affect your potential of succeeding. Over the years I found out that there are ways to really maximize your efforts so that you are able to lose weight in the most effective way possible. It makes sense to get to your destination in the fastest and least complicated way possible. Woudn't you agree? It took me many years to learn those principles and techniques. I know that they work because I personally used them to lose 119.6 lbs and keep the weight off for nearly 30 years. In the process I discovered a quality of life that I had only dreamed about. I could never have achieved the success that I have achieved in my life if I had not lost the weight I needed to. In my ebook I reveal 6 incredibly powerful secrets that I discovered and walk you through a 10 step process so that you can discover once and for all, how you can lose weight without having to experience the frustrations of learning what works and what doesn't. I have done all the learning for you. And now you have the benefit of me sharing the secrets with you. In an honest and straightforward way. I get straight to the point and tell you how to get started today. I do not believe that one diet fits all and I am going to tell you about the in's and out's of the most popular diets and weight loss programs and how you can choose a program that works for you. I am hoping that you will be committed to your weight loss program before you have read even half the ebook. I will go through the process with you step by step so by the end of the ebook you will probably feel like you know me personally. I'm going to show you how to plan for the journey towards your goal and enjoy the trip getting there. I am going to tell you what to do every day so that your results are phenomenal. I will describe for you how you can create the balance between where you are right now and where you need to go in your life. And then I am going to tell you in great detail about the things you can do and what resources are available to you so that you have the very, very best opportunity possible, to succeed. I will tell you what to do, what to be aware of, what to expect and how to deal with the unexpected. By the end of the book the 6 secrets will be your secrets and and you will have learnt in a short few hours what has taken me many years of time, energy, frustration, trial and error to discover for myself. I guess you must be asking yourself what my motivation is in doing all this? My motives are simple. My sincere desire in sharing the 6 secrets with you is my anticipation that you will discover a life for yourself, just like I did, that you could not have imagined, even in your wildest dreams. Testimonial: I needed to lose 28 lbs. I had no idea how I was going to do it. I read your 6 secrets and followed each of the 10 steps. The diet you recommended didn't "feel" like a diet, but best of all, I lost the weight in just under nine weeks. What you told me to do works. Testimonial: Your secrets are unique. I have lost nearly 12 lbs in just 2 weeks. I never had the motivation to start a diet before. Thank you for sharing the secrets. I couldn't have done it otherwise. If someone is going to tell you how to achieve something great, surely they must have achieved the same thing for themselves? Makes sense doesn't it? They must personally be able to prove that what they are telling you to do is what they did, and that it worked for them. No if's or but's on this one! They must be able to prove that they have successfully maintained their ideal weight for a lengthy period of time, preferably longer than 5 years. That's where the real proof lies: in a long term solution, not a short term fix! I normally charge $150.00 per hour for a consultation, just you and I. I know that that I would not be able to cover all the information that is contained in my ebook in one consultation even if I was to try and be as brief as I could. I may get through the main points in two consultations if I was to do all the talking. So you can see that, if you were to meet with me personally, I would charge you at least $300 for the information you are getting in my ebook. You get an easy to download, high quality and professionally presented ebook full of invaluable information from begining to end. Your ebook contains the 6 secrets together with the 10 steps to get you started today on the journey to a new you. There are hyperlinks within the book for you to click on that will instantly take you to other internet sites that I know you will want to visit. If you respond right away, you pay only $17.87 $9.87. A whopping 40% discount on the cost of attending my exclusive and much sort after group "Lifestyle Mentor" program where I work with individuals like yourself each week on the telephone to help them achieve their weight loss dreams. What's more, I am not able to accept everybody who wants to get on the program. But, in this instance I will guarantee you a place provided you let me know within the next 10 days that you want to participate. Complimentary subscription to my monthly "Lifestyle Insider" ezine which is filled with all kinds of useful information and offers that I know you will love and find irresistable. I only make this ezine available to my most personal clients. This is worth $47.00. Free 60 minute conference call to discuss the 6 secrets and 10 steps - the only cost to you are your long distance charges - if applicable. The value of this call alone is $97.00. "Your satisfaction is assured through our no risk, you-can't-lose, 100%, no-questions-asked, iron-clad moneyback guarantee. If for any reason, you aren't thrilled and satisfied with our product, just contact us within 30 days and we'll refund 100% of your purchase price. No hard feelings." "What I'm saying is, don't decide now if this product is for you. Just download it and get started . If it doesn't do everything I say and more, if you don't find the information it contains amazingly helpful, if it isn't life-changing, if it doesn't work for you, you have nothing to worry about because you can get every dime of your money back under our no-loopholes guarantee. So you have nothing to lose and everything to gain." P.S. Remember, places on my exclusive and highly sort after group "Lifestyle Mentor" program are very limited. I can only guarantee you a place at a whopping 40% off if you tell me within the next 10 days that you want to participate. P.P.S. Also, don't forget to immediately reply to my e-mail when I send it to you, indicating that you want to attend the free 90 minute conference call where I will personally discuss the 6 secrets and 10 steps. I will also answer any questions you have, on that call. Space is going to be at premium and I would hate to disappoint you!